ITIL is often called the most popular framework for IT service management (ITSM) but its last update was in 2011 which, when we consider how quickly the business world is changing these days, is fair to say was quite some time ago. But all of that has now changed, with 2019 bringing with it the latest update to the framework – known as ITIL 4. Luckily for you, I’ve just read the ITIL 4 Foundation book and, now that I have a clear understanding of how it differs from previous versions, I bring to you my latest A – Z to explain what ITIL 4 is all about. You can also read my blog “10 Key Changes in ITIL 4 (and My Take on Them)” if you have the time. While this blog assumes that you have some basic ITIL knowledge already I’m sure even a total newbie to the framework will be able to glean some insight into what it’s all about too. So, please buckle up and enjoy the ride as I take you through the ins and out of the new and improved ITIL 4. ITIL 4 contains seven guiding principles (which you can learn more about under the letter G). For now, I’ll just explain that these are an evolution of the nine guiding principles contained in the ITIL Practitioner publication and they’ve been updated and refined for ITIL 4. One of the principles is to “start where you are.” At first glance this sounds a bit obvious but, as we all know, when we’re faced with big complex tasks the best thing we can do is to remind ourselves of the simple stuff. When you assess where you are right now you’ll be able to see what’s working for your organization and what isn’t. This means you can keep all the good stuff and work out a plan to improve the not-so-good stuff. ITIL 4 definitely doesn’t want you to scrap everything you’ve already done and start over, it wants you to progress and improve from where you are right now. So, start where you are! The new version of ITIL has shifted itself into a more holistic position, encouraging organizations to work together as a whole rather than in siloed teams. In the past, there’s been a desire to work within team boundaries, with each team optimizing their own operations and processes, and coming up with their own goals. The problem with this way of working is that teams don’t see the bigger picture, their goals won’t likely align with the company’s goals, and so things can go south pretty quickly. Rather than battling with the issues that a siloed workforce can create, ITIL 4 encourages collaboration and transparency, and a culture where people work together to achieve the same objectives and goals. Delivering value to the organization and all of its stakeholders is the main focus of ITIL 4 and this is done through “the co-creation of value.” And providing value doesn’t only mean value for customers but also value for the organization and other stakeholders too. The co-creation of value is all about working together with customers, suppliers, partners, and other stakeholder groups in order to develop and deliver products/services that work well for all. Value will mean something different to each stakeholder group, and thus co-creation ensures the needs and expectations of each are understood and met. In short, I suppose it’s fair to say that co-creation equals a win-win environment. What’s not to love? As AXELOS states (well, it’s something like this): “The fourth industrial revolution is upon us” – digital. It’s fair to say that digital is disrupting the way we work, changing our expectations of what’s possible, and evolving far quicker than any revolution that has come before it. Most businesses these days are digital in some shape or form and it’s not really a stretch to say that most organizations need digital technologies in order to survive, and that need is only going to increase. The update to ITIL still includes all of the key components required for effective service delivery, but it now offers guidance to organizations who are embracing digital and all of the chaos and excitement that comes with that transition. ITIL 4 is flexible and customizable – making it fit for the rapidly changing needs of stakeholders. The amount of expert knowledge that has gone into the creation of ITIL 4 is quite considerable. 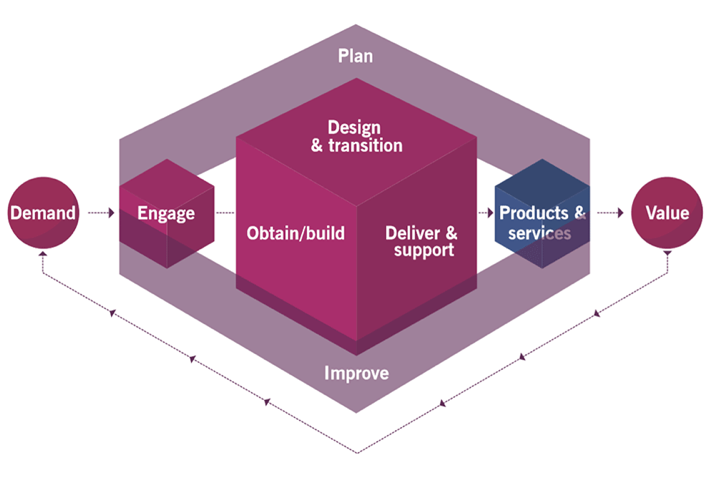 These dimensions are a key part of ITIL 4, with the idea being that each one should be given specific focus when designing, managing, and improving services. No matter the service, the four dimensions should be consulted, and these dimensions show that ITIL really has become a more holistic service management framework. Organization and people (the cultural dimension) – this involves supportive cultures, clearly-defined roles and responsibilities, a system of authority, the importance of soft skills, and the need for every person within the organization to understand the value their role delivers to the business. Information and technology (the data dimension) – this involves the information and knowledge that’s needed for managing services, along with the technology that’s required. This is a flexible framework, so considers emerging technologies too and how they might disrupt a service or be used to support services going forward. Partners and suppliers (the relationship dimension) – this involves the relationships an organization has with its partners and suppliers as well as any contracts/agreements it has in place. These days, most organizations will need the help of at least one supplier when it comes to designing, delivering, supporting, and improving its services. Value streams and processes (the working dimension) – this involves defining the “activities, workflows, controls, and procedures” needed to meet the goals of the organization in a way that delivers value to all stakeholders. The guiding principles aren’t actually new to ITIL, they were originally introduced in ITIL Practitioner as the nine guiding principles, but – as already mentioned above – they’ve been condensed and updated for ITIL 4. Focus on value – whatever the organization does, its focus should be on providing value to stakeholders all of the time. This is why the IT organization exists and this is what ITIL should truly stand for. Start where you are – remember this from the letter A? Don’t undo the good work you’ve already got in place, ITIL 4 isn’t about starting again. Start where you are and grow. Progress iteratively with feedback – see the nod to Agile here? No more massive projects, it’s all about bite-sized chunks and getting it right before moving on to the next stage. Collaborate and promote visibility – ultimately, it’s all about the right culture. Be transparent and work together. Think and work holistically – it’s an end to the process myopia, so put the days of siloed working in the trash and understand that everyone is involved in reaching the same end goals. Keep it simple and practical – there’s no room for complexity, it’s damaging and unnecessary, but we’ve too-often got caught up in it in the past. Do what’s necessary and move on – this might be my new personal motto. Optimize and automate – reduce the pressure on staff wherever possible. Automating the high volumes of menial tasks and allowing staff to focus on the bigger challenges is where value creation can come to life among employees. Did you spot that I had to quickly think of somewhere else for governance after the guiding principles took the letter G? 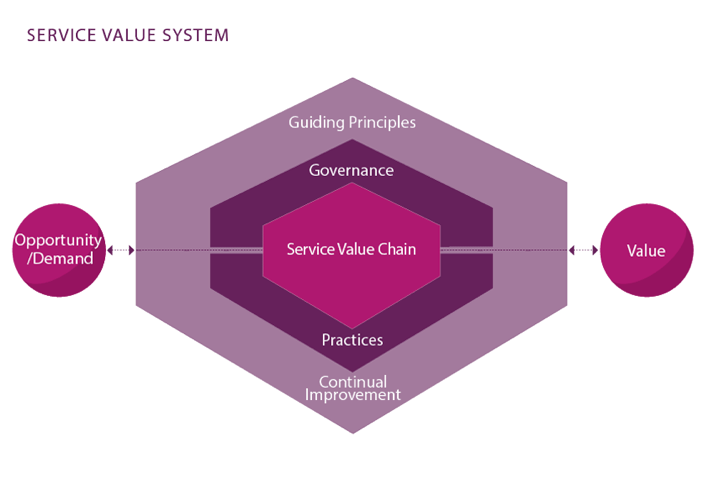 Governance now takes a key seat in ITIL 4, being one of the key components in the service value system – which we look at in more detail under the letter S. Without governance and the involvement of authority it would not always be possible to deliver value to stakeholders. ITIL 4 isn’t designed to stand alone, it can be integrated with other frameworks such as Agile, Lean, and DevOps. It’s flexible and customizable, making it ideal for the digital age – where being able to adapt quickly to change is key. ITIL 4 has been designed such that organizations can use these and other different frameworks and methods as and when they need to do so. OK, I admit that I was struggling with the letter J, especially as the ITIL 4 Foundation book jumps from the letter I to the letter K in its glossary! Actually, it’s called the service value chain. This is new to ITIL 4 and a crucial part of the update (unfortunately, it neither jingles nor jangles but it does help in the development of products and services which I suppose is a tad more important). Ensure its stakeholders are happy (value realization). These activities guide an organization when creating and delivering its products and services. There are six value chain activities with each one transforming inputs into outputs using ITIL practices to do so. Deliver/support – where services must be delivered and supported to agreed expectations and specifications. If you’ve been reading carefully, you’ll recognize this as one of the seven guiding principles in ITIL 4. It’s important because, in this new age of adapting to frequent change, complexity has the potential to cripple an organization. You’re not going to be able to be flexible or deliver services efficiently if activities and workflows are not simple. ITIL is now focusing on guiding organizations in a similar fashion to Agile – where simplicity is what matters, only doing what needs to be done for the job to be completed and nothing more. Furthering the similarity with Agile, another guiding principle is to “progress iteratively with feedback.” ITIL 4 has waved goodbye to any idea of long, complex projects and focuses on delivering smaller projects more regularly. Plan, collaborate, deliver, get feedback, and then go again. It’s far more valuable to deliver a project in iterations because it allows problem areas to be caught and ironed out before too much work has gone into creating something that doesn’t meet the needs of the customer. Change control in ITIL 4 is all about maximizing the number of successful changes made to products and services. It looks at thoroughly assessing risks and ensuring the right authorizations are in place before changes are made. Fun Fact: In previous versions of ITIL, change control was labeled change management which was sometimes cited as a blocker to change due to the high levels of bureaucracy and too much control around each change. This is likely why there’s now more of an emphasis on maximizing successful changes. I might have mentioned once or twice by now that ITIL 4 has shifted to a more holistic way of thinking and working. Plus, ITIL isn’t just an ITSM framework anymore, with it keen to be seen as a service management framework instead – putting it more in line with “enterprise service management” (although this is never mentioned in the Foundation book) and newer service management approaches such as VeriSM. The need to differentiate between outputs and outcomes isn’t exactly new in ITSM but, given the focus on value that ITIL 4 now has, I thought it was worth mentioning (and it might be helpful to you if you’re reading this as someone totally new to this world). ITIL 4 is all about value (have I mentioned that?) – not simply just delivering services but delivering services that provide value to the organization and each group of its stakeholders too. To really deliver value we need to be looking at the outcomes of our services rather than the outputs. But what’s the difference? A successful outcome means that you’ve delivered the results your stakeholders want – whereas outputs are the activities that make that happen. Management practices have replaced processes in this new version of ITIL. When you think of an ITIL process you might think of “incident management,” “problem management,” or availability management,” for example. These still remain in ITIL 4, but they’re now known as management practices and they sit within three different groups. General management practices – this grouping contains 14 management practices, examples include project management, relationship management, and risk management. Service management practices – this grouping contains 17 management practices, examples include problem management, release management, change control, and incident management. Technical management practices – this grouping contains 3 management practices, these are deployment management, infrastructure and platform management, and software development and management. A management practice has been defined in ITIL 4 as, “a set of organizational resources designed for performing work or accomplishing an objective.” And all practices are subject to the four dimensions of service management that we explored earlier. The new ITIL 4 Foundation book includes a fictional company that’s followed on its ITIL journey. The ITIL framework can be used by all types of organizations and it’s nice to see how a company might apply each stage. It’s a clever way of bringing the framework to life and showing how it might work in the real world. Remember when we looked at value co-creation (you’re right, it does feel like a long time ago!). Well, the co-creation of value can only happen when you’ve a good relationship between the organization itself and all its stakeholders. A healthy, mutually-beneficial relationship where all relevant parties are actively involved is at the heart of value realization. ITIL 4 says that service management needs to work as a system, with this in mind the update brings with it the brand new “service value system” (SVS). On the left (in the diagram above), you can see the key inputs that go into the system – opportunity and demand. These are the possibilities and options available to the organization, and the needs and desires for services/products from both internal and external stakeholders. Not every opportunity or demand is going to be invested in but those that are go through the SVS coming out the other side to deliver value to the intended stakeholder(s). The SVS shows the components and activities of an organization working together as a system to enable value creation. The system is flexible and there isn’t one correct combination to be applied, instead it supports multiple combinations meaning organizations are able to adapt to change. These various components are required to enable value creation – all of organizational governance, practices, guiding principles, and continual improvement must work together to achieve the ultimate outcome… value. The key activities that are needed in order to respond to demand and realize value go through the “service value chain,” which you can see in the image above, are central to the SVS (and which you learned all about under the letter J). ITIL 4 promotes the use of technology to help us wherever it can. The guiding principle “optimize and automate” focuses us on this. If we can automate repetitive tasks, then we should. Because this will free up people to focus on more complicated and/or complex tasks to provide greater value to the business. But, this does come with the caveat that automation “for the sake of it” is not wise and automation plans should be carefully thought out. So, it’s not technology for technology’s sake, it’s technology to help us be the best that we can possibly be. Very Game of Thrones-ish I know. ITIL 4 is new right now and this initial (Foundation) release is only the first part, further updates – including for the higher-level ITIL 4 exams – can be expected throughout 2019. You’ve probably got the point by now, but I thought I’d mention it one more time just in case (that and the letter V is always a tough one). ITIL 4 is completely focused on helping organizations to deliver services that provide value to stakeholders. ITIL defines value as, “the perceived benefits, usefulness, and importance of something.” In other words, value can be subjective and is based on the perception of the stakeholder rather than the service being delivered (remember those outputs vs. outcomes we looked at?). Organizations exist to provide value to their stakeholders. And ITIL exists to help organizations to deliver value through effective service delivery and management. Collaboration has become vital to modern-day success, in fact working together forms the basis for Agile, Lean, and DevOps. The ITIL guiding principle, “collaborate and promote visibility” supports this way of thinking to help people and teams to stop working individually and to instead work together to achieve the organization’s desired goals. Promoting visibility means that more people will be aware of what’s going on and why it’s happening – which is the best way to avoid rumors and gain buy-in. Not having the relevant people on board can make everything ten times harder than it needs to be. Ultimately, any activity is less likely to be an issue when everyone (who needs to be) is involved. … the rapper is rumored (by me) to be a big fan of the latest ITIL 4 guidance. Who’d have thought it? I’ve spoken a lot about how this update to ITIL focuses on the co-creation of value, which is done through service relationships with stakeholders. And these stakeholders come in all shapes and sizes and aren’t only limited to the consumers of your services. So, when you’re thinking about delivering value to your stakeholders you need to consider more than your customer(s). Some other stakeholders might be partners, suppliers, social groups, your employees, and shareholders. All of these relationships are important and making one group unhappy could easily put your relationships with others at risk. ITIL 4 helps you to build upon your stakeholder relationships and provide value to all these groups. I don’t know about you, but this is where my head is at after writing and checking this mammoth ITIL 4 blog (it’s 3500 words!). I hope you’ve found it useful, but for now I’m off for a much-deserved lie down.